Toyoda apologizes to shareholders for mistakes – and tears. CEO Toyoda at confrontational hearings on Capitol Hill, last February. He's been criticized for crying during subsequent meetings with company employees. 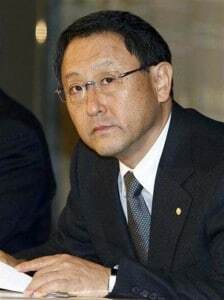 There may be some sighing, but there’ll definitely be no more crying by Toyota’s embattled president and CEO Akio Toyoda. Facing significant pressure in the wake of a worldwide safety crisis that has led to the recall of millions of vehicles – including more than 8 million in the U.S. alone – Toyoda offered his apologies to investors during the annual Toyota Motor Co. shareholders meeting. Toyota shareholders appeared willing to accept the executive’s apologies for the problems that have driven down the automaker’s stock price by more than 20% in recent months. But one matter seemed to raise the hackles of investors in a nation where the showing of “face” is all-important. During a question-and-answer session, Toyoda was faulted for crying while meeting with Toyota employees after the hearings on Capitol Hill. “I will try not to cry like that again,” Toyoda responded. But industry analysts say that the CEO’s trials and tribulations are far from over. While there haven’t been any new recalls in recent weeks, Toyota is still under close scrutiny by U.S. safety regulators, as well as the Justice Department. It is facing labor unrest in the critical Chinese market that has idled a key plant and which could sharply drive up costs. And, perhaps most embarrassingly, Toyota plunged on the closely-watched J.D. Power and Associates Initial Quality Survey earlier this month, falling from sixth to 21st position, even as U.S. rival Ford was cited as the top-ranked mainstream car brand. Following the second recall related to sudden acceleration – and revelations that Toyota had effectively prevented an earlier recall in a bid to save several hundred million dollars – Toyoda personally named a new czar to oversee safety-related issues. Company officials last week said he has ordered a redoubling of efforts to regain Toyota’s long-running reputation as one of the leaders in automotive quality.